I'm finally getting around to playing along with the Featured Stamper Challenge on SCS. This weekly challenge allows us to browse through a featured stamper's gallery and CASE one (or more) of their cards. This week's stamper is Sumtoy. You can check out the challenge deets HERE and see Sumtoy's gallery HERE. This is the card I chose to CASE - Green and Silver Cake We are encouraged to make a few changes to our card. I decided to change up the ribbon and its placement. I added a sentiment and changed the color. I've been wanting to emboss DSP with my Big Shot and lightly sand the raised embossed areas. This card inspired me to give it a try! I used a piece of Flowers For You DSP (yes, I'm still trying to use up the old stuff) and the Texturz Background 1. I then wanted to heat emboss the raised embossed design but it didn't turn out like I had imagined. I 'thought' I was lightly dragging my VersaMark pad across the embossed design but when I added the clear embossing powder, I clearly was mistaken. The entire piece of DSP was coated and, therefore, embossed. I like how it turned out though. It has a certain shine and shimmer to it that, irl, is pleasing to the eye. 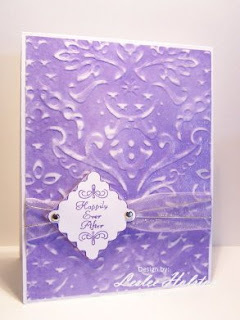 The sentiment from the retired Fancy Flexible Phrases was inked in Lovely Lilac and stamped on Whisper White. I punched the sentiment with the Scallop square punch and layered it onto a 1-3/8 square of Lovely Lilac. The silver brads are the finishing touch. I hope the couple receiving this card will be blessed with a lifetime of love and happiness. Just like I have been! Thanks for stopping in. I hope you've been inspired to try that something that you've been wanting to try. It may not turn out just as you had planned but it might just look fabulous anyhow!